Ball Pool, artist Stephen Hanson limited edition print. Have you met Toby? 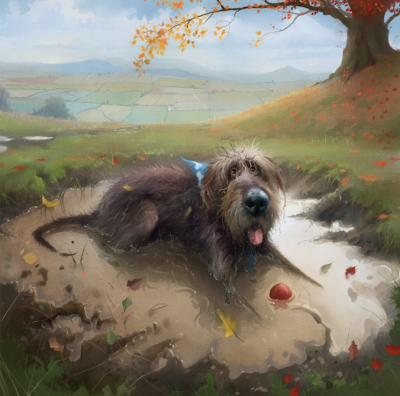 Based on Stephen Hanson's real-life pet, the artist has captured Toby's grand, autumn day out in this new collection of three paintings - Toby's Autumn Day. A wet Autumn day isn't going to stop Toby having fun in Ball Pool, a wonderful limited edition painting. The perfect artwork for any dog lover, why not get the whole set and see all of Toby's tale?